I am a loyal and committed Spotify user. When Apple launched Music last week, there didn’t seem to be much that would make me want to switch from Spotify. The streaming service appears to have more or less the same catalog as Spotify, I don’t really like radio and so Beats1 doesn’t interest me, and I have no real desire to follow musicians via Connect. But today I spent a lot of time in my car and the Siri integration with Apple Music is fantastic – and possibly enough to make me pay for the subscription following the three-month free trial. To get the most out of it, I recommend that you enable the “Hey, Siri” functionality that was added in iOS8. This will allow you to access Siri and Apple Music completely “hands free” while your phone is on charge. To do this, you simply need to go to the Settings app and select “General” and then “Siri”. Then, simply make sure that the switch for “Allow ‘Hey Siri’” is turned on. If you own an Apple Watch, then “Hey Siri” is already enabled – just lift your watch and speak. All the commands below work just fine via your watch. 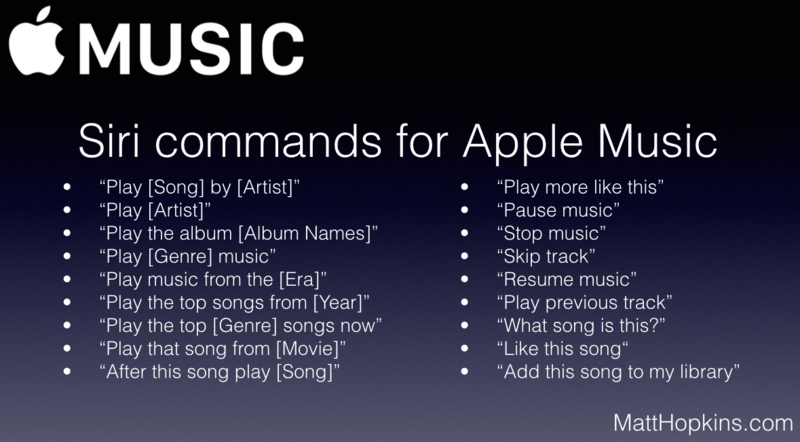 Here’s some of the commands that you can use – remember, you can say “Hey, Siri” before each of these to have a hands-free experience (if you’re in a car, then this is essential). You can use variations of these commands too. 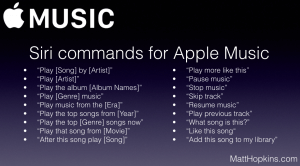 Such as “Hey Siri, skip this song” or “Play the most popular songs in 1999″.. or with the movie soundtracks, you may sometimes need to let Siri know what you mean by saying “Play that song from the movie Whiplash”. Unfortunately, it seems that there’s no access to playlists at the moment, but I am sure that this will arrive in the near future. I always wondered why Apple didn’t allow you to change your default music player like you can for browsing, search etc… but now I know. The Siri integration with Apple Music is what sets it apart from Spotify and others now and it is simply brilliant.